You are here: Home / Found a Grounded Bat? Bats sometimes appear in houses or on the ground outdoors during the day time. After a long winter’s hibernation bats may become dehydrated or exhausted. In summer young bats may be unable to fly properly. Bats can sometimes be caught by cats which may use the bat as a plaything and cause serious internal or wing tissue injuries. Old age, illness or even collisions with road traffic may also cause bats to become grounded. 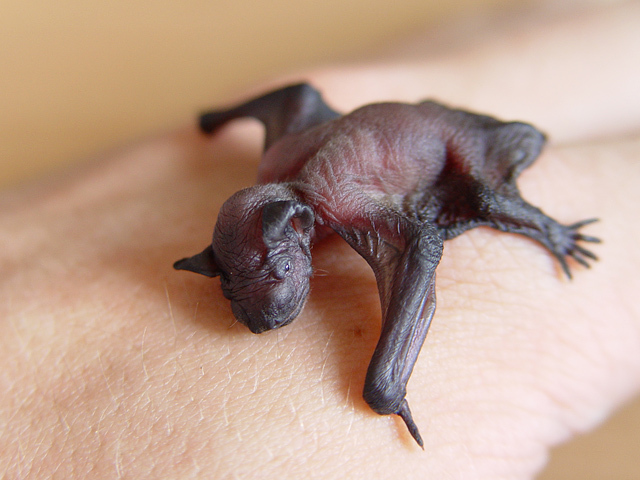 Sometimes people are surprised by how small bats are and assume that the grounded bat they have found must be a baby. However, bats are among Ireland’s smallest mammals and many weigh less than 5g (the weight of a €1 coin) so they can appear extremely small even when fully grown. Babies are born around June or early July so, unless it is at this time of year, chances are your grounded bat is not a baby. 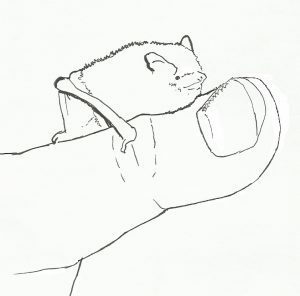 Our smallest bat, the soprano pipistrelle, can fit on the end of your thumb, although please note that we urge you never to handle a bat with bare skin. ALWAYS USE GLOVES. 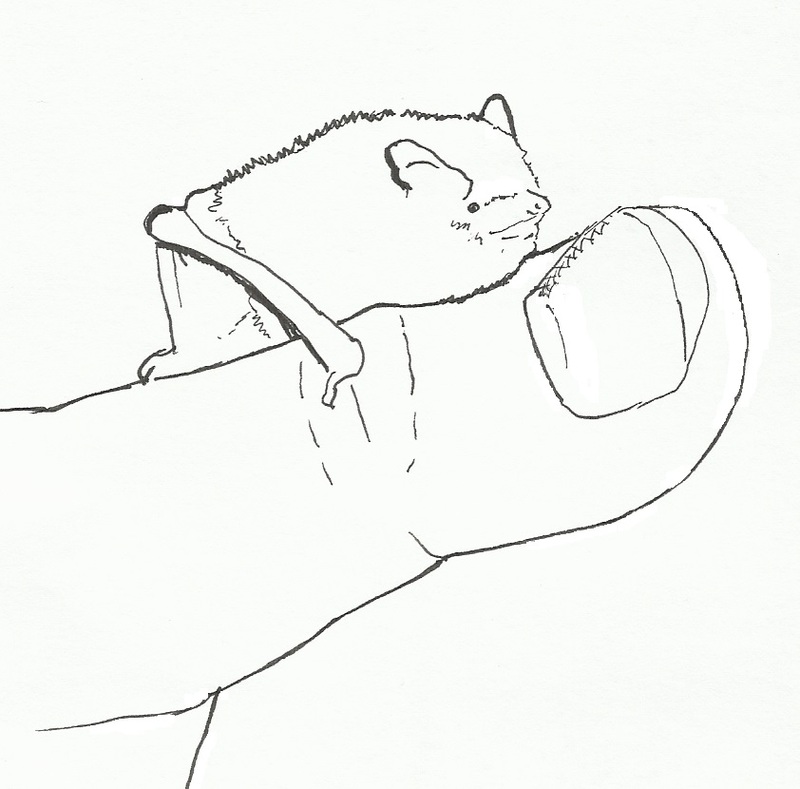 Illustration of relative size of an adult pipistrelle bat in the hand. Pipistrelles are among the smallest Irish bat species. If a bat is inside the living space of a building, it is lost and trying to get out. You can help it to escape. Bats are not aggressive and will not attack you but a bat may bite in self-defence if you try to pick it up. Therefore, ALWAYS USE GLOVES if you need to handle a bat. If it is a mild evening and the bat is trapped inside, confine the bat to one room, one with access to the outside – that has a door or window to allow the bat to escape. Open the window(s) fully or exterior doors fully, switch off the lights and close any interior doors and let the bat fly out. If you are not sure whether it has flown out check behind curtains, behind wall hangings or pictures and also lower down under sofas etc. If it is daylight wait until it lands and contain it in a shoe box with a secure lid until dusk when you should release it outside. Do not release a bat outside in daylight hours. The best way to pick up a bat is to scoop it up gently with a tea cloth or pair of gloves and place in a prepared shoe box (or equivalent). Remember to ensure that there are pin holes in the lid to allow air to get into the box. Place a small cap full of water in the box, using an upturned cap off a drinks bottle is perfectly fine. The Cork County Bat Group produced this very useful video with information on how to remove a bat from your home. Grounded bats should never be handled with bare hands. ALWAYS USE GLOVES as bats may bite in self-defence. Short term solutions for a bat that appears tired is to contain it in a shoebox with small ventilation holes punched in the lid and provide it with very small amounts of fresh mealworms or very finely chopped up dog or cat food. Water to drink can be provided through a dropper or from the end of a drinking straw, or place an upturned lid of a drinking water bottle with water in it in the box. Keep the bat in a dark quiet room, at room temperature. Injured bats need to be assessed by a trained carer or vet in order to determine what the best option is, whether it may be rehabilitated or if its injuries are too severe, euthanased. For further advice on caring for bats and contacts of wildlife carers and veterinary surgeons with bat experience see the Irish Wildlife Matters website. Do not release a bat outside in daylight hours. Sometimes people are surprised by how small bats are and assume that the grounded bat they have found must be immature. However, bats are among Ireland’s smallest mammals and many weigh less than 5g (the weight of a €1 coin) so they can appear extremely small even when fully grown. Babies are born around June or early July so, unless it is at this time of year, chances are your grounded bat is not a baby. Baby bats, which are born in June or July, are born blind and furless and will appear like this for several days until they start to grow. If you have found a baby bat and are unsure where it came from it would be best to contact a trained carer or a member of the staff at the NPWS in the Republic of Ireland or in Northern Ireland, CEDaR or Northern Ireland Bat Group.